Another Hopkinton to Boston run complete. Great job everyone! And the all the runners! Very impressive job by each and every one of you on a very challenging day to run. I hope you enjoyed the experience. Now sit back, kick your feet up and relax. You deserve it! We had a few non-SLR runners comment on how much they enjoyed our company out on the route today. It makes me proud to be associated with such a good group of people that others notice us in good light. Also thanks to Nancy for spearheading the collection for the fallen firefighters. Today we donated the water stop money plus donations collected in the cars to the Newton Fire House which they will forward on to the fund set up for the families of the firefighters. Thanks! Everyone dry off, thaw out, and, if you’re running Boston, start tapering! Thanks to all that have volunteered their cars for this week’s run. Opting for the bigger cars, here’s what I think I have for seats (including a driver). We have more seats than runners so things are looking good, still room for a few more though. Jen Dodge, I removed her as a driver, replacing her with Ginny. She’s still welcome to come along and help with the water stops… and even run a bit if she wants. Paul Donahue, you’re off the hook for donating your car since I’d rather Ginny drive her own. We’re still planning on using the Locke Minivan though, if that’s ok. Brian Walfield, I may swap your car out for mine if the numbers stay as they are. Note: We’re meeting just before 7AM behind Brueggers on Sunday Morning! They’ll be a more detailed plan out tomorrow, but the key points are drivers show up around 6:30 so we can load up the cars correctly. Runners show up around 6:45 and find your spots. We want to pull out of the parking lot around 7 so we can be running by 8. Also we’ll be going to the Dockside in Wakefield on Sunday afterwards, usually around 1 or 2PM for lunch so if you can, join us! If you don’t see your name on the list and you plan on running, or you know someone is running and they didn’t put their name on the list, let me know as soon as possible, I want to make sure we don’t run out of seats! In my cold medicine delirium on Sunday I seem to recall others wanting to come. Please Post Here! If you see your car on the list and you didn’t really mean to volunteer it, let me know now! If you see yourself listed as a driver but you were planning on running, not driving, let me know now! Otherwise I think we’re in good shape. This week we do Swain’s Pond and Breakheart (seriously, is there still ice there?!). Start up East Foster, turn onto 6th Street which becomes Swain’s Pond. Run until you get between to ponds then remember Swains Pond Ave turns right at the next intersection. Follow that to Lebanon where you go right, left at the lights onto Forest and then you’ll find the water stop at Citizens Bank on Main Street in Malden. Water stop. Take Winter Street over to the Oak Grove T Stop, over the tracks into a five way intersection. Go straight across onto Glenwood, through some windy hilly streets and you’ll magically find yourself at the rotary at the Fellsway East and Highland Ave. Go right there onto the Fellsway and run through the hills, past Grimsbys, onto the LynnFells Parkway over to the knoll across from Melrose High School. Water stop. Running short? Go up to Main Street and right to Brueggers. Running long? go straight until you get to Breakheart. Water Stop. Loop through Breakheart however you can without hurting anything and come back out the way you came in. Water Stop. Head back down the LynnFells Parkway back to the knoll. Water Stop. Now take the LynnFells over to Grimsbys, turn left on West Wyoming and left on Main St til you get to Brueggers. Stop. 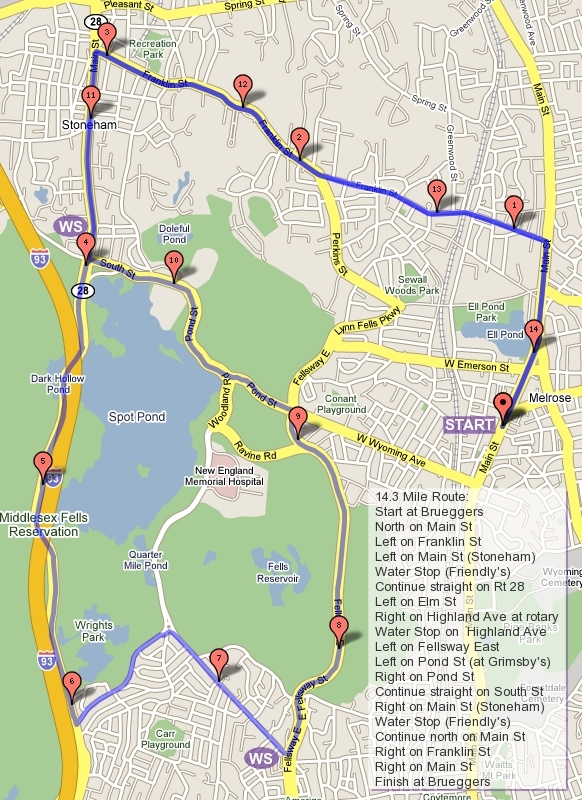 Time to plan the Boston Course Run which will be on March 30th this year. For those new to it, or those that have forgotten, three weeks prior to Boston we leave Brueggers at 7AM, carpool out to Hopkinton, people get out and run, others move cars from water stop to water stop along the whole course, and in the end we all wind up at Boston College around lunch time. After that we head back to Melrose, move on to the Dockside and have lunch. To make this all happen without a hitch everyone must follow my elaborate plans. (1) Who has a big car? As runners sign up we need a seat in a car for each of them, so I need to have a few volunteer cars that can at least seat 4 runners comfortably (remember you’ll all have to sit next to someone who just ran 22 miles!). If you want to volunteer your car let me know here and indicate how many it can seat including a driver. If you volunteer your car be prepared for it to be in use between 7AM and 2PM. (2) Who wants to drive? Note that its very difficult to run and drive at the same time. I know you all can drive from Melrose to Hopkinton, I’m more interested in who can drive the car along the race course from Hopkinton to BC. People who want to run only half of the course can drive the other half. This usually works out that two cars are for switching in Wellesley during the run. If you’re driving be prepared to be needed between 7AM and 2PM. (3) Who wants to run? I assume somewhere between 1 and 50 people which makes it hard to plan. Let me know you’re running (if you don’t I won’t have a seat for you), and how far you plan on running (full or half, of somewhere in between). If you’re running the half indicate a preference of first half (flat to downhill) or second half (flat to hilly). I’ll try to fit you in to your preferred part of the run. Again, if you’re running just a bit of the run be prepared to be with us from 7AM to 2PM. (4) Buts? If you have a special case (I want to run but I need to….) consider the impact on everyone else before you ask. This isn’t simple to plan and the equation gets more difficult with each request. I’ll do my best to make things work but not all variations can be accommodated. OK, who wants in? Again I have to know you’re coming to have a seat in a car for you. Week 10 – Hmmm, Breakheart? Nice job to all that ran the 20 last week, or any other distance for that matter. The weather was pleasant and you all looked strong from water stop to water stop. An amazing feat by an amazing group! So… this week we’re supposed to take another trip to Breakheart. Well, we haven’t really been in Breakheart yet this year so it would be our first trip there. I haven’t been up there so I’m not sure if the paths are finally clear enough to take a trip through. I’ll check it out tomorrow, if its runnable we’ll keep the route the way it is, if its still too slippery we won’t risk injuries but instead add Pine Banks on the end of the run. Update: I just walked Breakheart. As you go in from Wakefield your first impression will be “this is too icy”. You won’t be able to run to the right. It’s a mess leading up to, going up, and coming down the hills. The tops are clear though. If you go left you’ll have about 20 yards of iffy stepping, then you’ll hit pavement. There are patches of ice you’ll have to be careful on, and as always in the morning watch for black ice, but I think you’ll have a pleasant run through Breakheart. So the plan will be to head over there, go left when you enter the gate, run to the beach and bear right which will bring you to the Saugus side parking lot. Got through the lot (use the bathroom if you need) and then continue on to the flatter side of Breakheart. This will bring you back to the beach where you bear right to bring you back to Wakefield. If at anytime you feel uncomfortable with the footing turn back. If you need extra miles to make up for parts you skipped, or if you just like to run extra miles, when you get back to Melrose take a turn left onto the Summer Route after Whole Foods and add on extra miles there. This week the run is 16 miles, a big jump back from your 20, or 8 after your 10 miles last week. . This is a recovery run, flat most of the way with a little challenge in Breakheart to keep you honest. The route: Head North on Main Street, stop at Nick’s Pizza parking lot for a drink. Continue on Main St, around Lake Quannapowitt and back Main St to Nick’s Pizza for a drink. Head across Nahant St into Breakheart and around the path counter-clockwise alllll the way around, back out and across Nahant back to Nick’s for a drink. Head back up and finish up at Brueggers. If you’re running the shorter route come to Nick’s, have a drink, head to the lake, take a left when you get there, back along North Ave, grab another drink and head on back to Brueggers.